LAS VEGAS -- The packed sidewalks on the Las Vegas Strip became a scene of horror as a woman deliberately plowed her car into groups of partyers and tourists, killing one person and injuring dozens of others, authorities said. The woman in her 20s, who has not been identified, struck pedestrians as she drove onto the walkway in front of the Paris and Planet Hollywood casino-hotels on Sunday evening, police said. Clark County Coroner John Fudenberg said Monday that 32-year-old Jessica Valenzuela of Buckeye, Arizona, died in the crash. The coroner said the suburban Phoenix woman was visiting Las Vegas with her husband. Investigators believe the woman driving a 1996 Oldsmobile intentionally "went up and off these streets, two or possibly three times," Lt. Dan McGrath said. A 3-year-old was in the car with her but was not hurt, police said. The driver sped away before the vehicle was found at a hotel and she was taken into custody, police said. Capt. Brett Zimmerman said Monday that the car was fully on the sidewalk twice, including once when it traveled for 200 feet. He said that video of the incident shows that it "looks like it's very intentional." Authorities did not give a possible motive for the crash on a busy stretch of Las Vegas Boulevard across from the dancing water fountains of the Bellagio hotel-casino where visitors crowd sidewalks as they head from one casino to another. The Miss Universe pageant was being held nearby at Planet Hollywood at the time. The woman was having her blood drawn and was being held in jail with charges pending. She had recently moved to the area; the car she was driving was registered in Oregon, authorities said. "This is a huge tragedy that has happened on our Strip," Lt. Peter Boffelli said. The injured were taken to three hospitals, including the adult who died. University Medical Center was treating three people in critical condition and two others in serious condition. 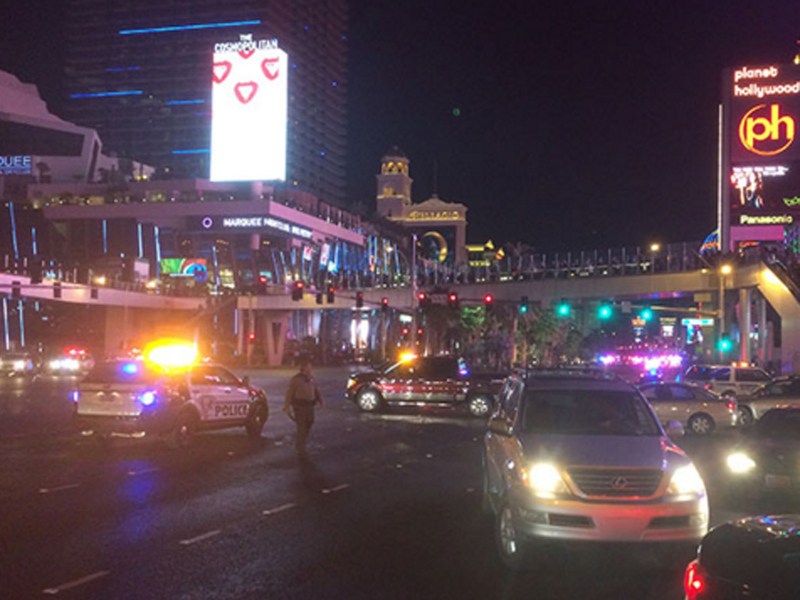 One of the injured is a 1-year-old child, reports CBS Las Vegas affiliate KLAS-TV. Of the victims, some were from Montreal and needed a French translator, while four were Oregon college students in town to compete in a wrestling tournament. One witness told KLAS some men tried to stop the car, but couldn't. Justin Cochrane, a visitor from Santa Barbara, California, said he was having dinner at a sidewalk restaurant outside the Paris hotel when he saw the car smashing into pedestrians. "It was just massacring people," he said, adding that the car appeared to be going 30 to 40 mph. The Oldsmobile then went farther down the road and drove back into another crowd of pedestrians on the sidewalk, he said. "Why would it slow to go around and then accelerate again?" he said. "I thought, 'It's a crazy person.'" Cochrane said he saw children and adults injured on the ground as the car drove away. Police were reviewing video from casino surveillance cameras to get details of what occurred. The pedestrians were not in the road and were not at fault, police said. Joel Ortega, 31, of Redlands, California, said he and his wife, Carla, were visiting for the weekend and found themselves blocked from walking on the sidewalk toward the Paris hotel. They could see police investigating about a block away from the crash. But then they learned that it was a crash scene. Ortega said it made them remember how their neighborhood was disrupted after the Dec. 2 mass shooting in San Bernardino, California, near their home. The crash comes months after another woman was accused of driving into a crowd during Oklahoma State's homecoming parade. Four people were killed and more than 40 were hurt Oct. 24. In September 2005, three tourists were killed and nearly a dozen injured when a car barreled through the crowd on the Las Vegas Strip and crashed into a cement barrier in front of Bally's hotel-casino.